I told you last time that I hoped it was the last time. Alas, it was not to be. Strange to hear me bemoaning a new root beer to review, but I’m just getting tired of Tommyknocker’s antics. They’re like the gambling addict who can’t quit when he’s ahead, or even when he’s losing badly. Just one more try they say, I’ll win it back, I’ll win more… It never works that way. They had a Seal of Approval, with their New Root Beer, they’d finally achieved some redemption, but no, they wanted to give it another shot, another spin on the wheel, and change their recipe. At least they had the decency to change their name again. Now it’s All Natural Root Beer, because evidently that’s just what they needed. They also dispensed with their “1859” and “original” from their labels, knowing that trying to claim the same original recipe since inception was so laughable it had become sad. Despite my annoyance, I dutifully purchased my bottles to see what they’d concocted this time. The Body is medium strength with maple and aged vanilla flavors that are all out of balance and don’t ensemble well at all. It’s also sort of sour. The Bite is spicy yet smooth so that’s at least good. The Head is excellent! The Aftertaste is a clumsy mix of maple, vanilla, and wintergreen wrapped in some sour herbs. Tommyknocker, what have you done? This is by far your worst brew yet. Though the Head and the Bite are good, the Body and the Aftertaste fail hard. It’s like you stopped trying halfway through. I figured it wouldn’t impress, but to be downright bad? Every try before at least had a rather rich mapley goodness, but now, it’s barely there. You had the Seal, you were ahead, but like the gambler, you put it all on black for double or nothing, and it landed on green. I’m sure in two more years they’ll tweak their recipe and name yet again. I have a feeling it will only get worse. See how it rates against other root beers. Yet another UK root beer. Well, kind of a UK root beer. Soda Folk is a UK company and this brew can only be obtained there, but the owner is from Colorado and the root beer is actually made by the Tommyknocker Brewery. I figured it out when I saw they used maple syrup and aged vanilla which Tommyknocker also uses. The labels used identical paper as well. The owner, Ken, said that it was even Tommyknocker’s recipe. Then I had to figure out which recipe it was since Tommyknocker seems to have a new recipe every other year, and whether or not it was unique. As best as I could track down it appeared to be Tommyknocker New Root Beer but with some slight differences in the nutritional info, most likely to meet UK standards. So it is different so I can review it. This was very welcome news to anthony who ordered this brew and graciously traded me some. Who’d want to spend shipping fees to England only to find it’s merely a vanity label? But since it isn’t on to the review. The Body is medium strength with aged vanilla and maple flavors. Wintergreen is also present. The Bite is strong, sharp, and spicy. The Head is good and lingers. The Aftertaste is more maple and vanilla with a little bitter hint, from the wintergreen. Well this is a pretty good brew. Especially when you think that it’s sold in England. I would say that it’s the best UK root beer yet, but since it’s made in Colorado, I can’t really label it that way. There is hope for our neighbors across the pond though, if they start liking this stuff, maybe it’ll raise the quality of the rest of their brews. See how it rates against other root beers. Some people hate staying the same. They eschew tradition and continuity in favor of change. The principle offender in the root beer world of this is Tommyknocker, having changed its name twice and its recipe four times in the last 10 years. So why would they keep with a good Seal of Approval formula? This time their “New Root Beer” is gone, replaced by an All Natural Root Beer, and since they changed the name they figured they shuffle the ingredients a bit, adding things like citric acid and deciding it’s wiser to put more Organic Root Beer Flavor than Caramel Color. So a new name, a new recipe, means new reviews for folks that do that sort of thing. Polar, the makers of Polar Classics Premium Root Beer was so inspired that they decided to change their label, name, and recipe too. Like adding more sugar and getting rid of their artificial ingredients. 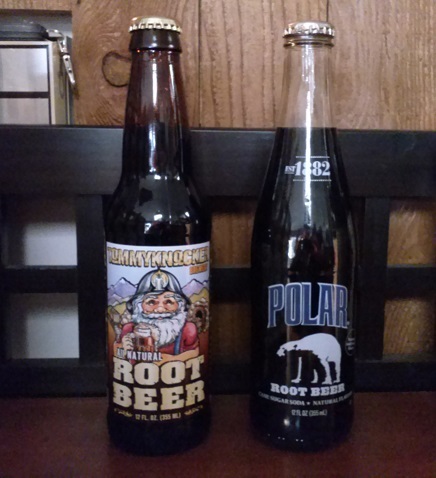 Now root beer reviewers everywhere can rejoice that there are two new brews to try and write about. Now if you’ll excuse me, I’ve got some root beer to drink.